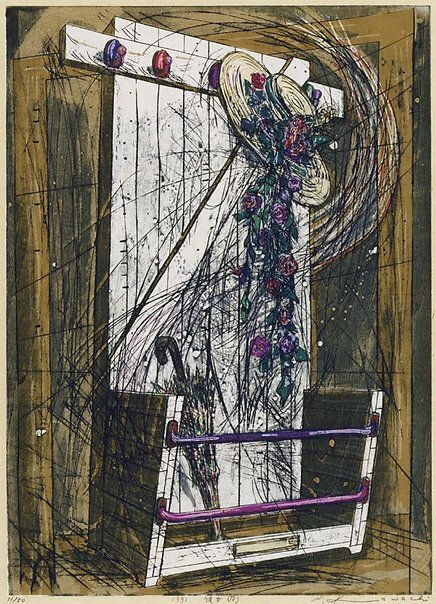 Kawachi was the most prominent of the younger artists who led the revival of the woodblock in the 1970s. He has been winning prizes since a student at Tama Art University, and his work has been sought by collectors from around the world. Born in Yamanashi Prefecture and now living in Tokyo, Kawachi is perhaps better known for his large, disquieting images of wooden beams stretched to breaking point. Such taut images, frenetically executed and full of tension and a foreboding sense of crisis, were regarded as metaphors for the catastrophe of our modern over-stressed society. This particular print is atypical of his oeuvre to date. In it his theme is love - for him, to decorate a hat with flowers for someone is an expression of love. The idea of depicting a loved one by association rather than physical presence has a long tradition in Japanese art. The most notable example is the genre of 'Tagasode' ('whose sleeves?') painting, in which the presence of a woman was evoked by the depiction only of her beautifully draped kimono - the subject itself is not depicted. 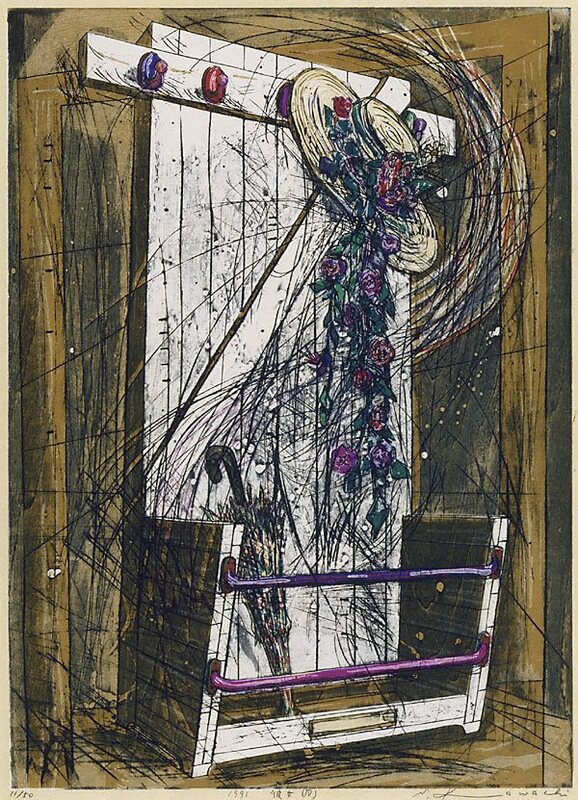 Although the subject is gentler and more personal than that of his earlier work, this print still contains the excitement, movement and frantic lines typical of Kawachi's style. While reviving the woodblock medium, Kawachi has added his own innovations. For example, he usually prints his colours first, and then his black lines, the reverse of traditional woodblock printing methods. In addition, for his black lines he employs a unique intaglio printing method that heightens their impact. Signed l.r., pencil "S.Kawachi". Dated l.c., pencil "1991".